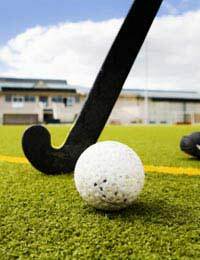 Hockey is over 4,000 years old and is thought to be the forerunner to all stick and ball sports, including baseball, ice hockey, cricket and lacrosse. Today, the game is played in 132 countries around the world and is second only to football in team sport popularity. Given the vast number of children, men and women playing the game, one would think the injury rate is rather high. After all, when the stick strikes the plastic ball, propelling it upwards of 100 mph and a player gets in the path of the ball or swinging stick, injury would be inevitable. However, it is estimated by Sport and Recreation Victoria, that only 15 per cent of hockey players are injured during a single season. "[These] injuries cause players to spend 11 per cent of the total hockey season training and playing at less than full capacity." The most common and serious injuries are the result of being struck by the ball or stick. Open wounds, fractures, sprains and strains as well as bruising and lacerations are the end result. Upper and lower body injuries are due mostly to stick/ball collisions but also over-use, especially the ankles and lower back. The upper limbs - hands and forearms in particular - are the recipients of most hockey injuries. The lower body also takes its share of hits - mostly to the ankle, feet and knees. Injuries to the head and eyes are rather infrequent, but when they do occur, they are severe, with a higher than average rate of hospital admissions. Injury prevention is key to playing hockey, especially since the players wear limited protective gear. Goalkeepers wear the most equipment - a helmet, face guard and shin pads. All other players wear shin pads and a mouth guard. Research is still required to determine the effectiveness of wearing protective eyewear and gloves for injury prevention. Another way to help prevent hockey injuries is for players to develop their skills at a young age. "Modified hockey rules for children give younger players a chance to develop basic skills before progressing to a more competitive level of play," reports Wake Forest University Health Sciences and Sports Medicine. "By gradually introducing and developing more skills, children's entry-level playing ability is far greater when they start to play hockey with standard rules." Coaches, who teach participants the fundamental playing techniques, should include the tenets of injury prevention, controlled risk taking and disciplined play, all of which are essential to injury reduction. Rules and their interpretation by the officials are also important. "Rules that limit the use of the stick and the ball reduce the risk of stick and ball injuries," according to Wake Forest. A safe and level playing field can also reduce the risk of all injuries. A rough surface may give rise to unexpected ball bounces that may produce face and eye trauma. Pre-season conditioning, with particular attention to improving strength, flexibility and endurance can also help a player prepare for the season and minimise injury rate and/or severity.